SWING VOTE is the hilarious new comedy with a stellar Hollywood cast headed by Kevin Costner (Robin Hood, The Bodyguard), Kelsey Grammer (Frasier), Stanley Tucci (The Devil Wears Prada), Dennis Hopper (Speed) and Nathan Lane (The Producers). 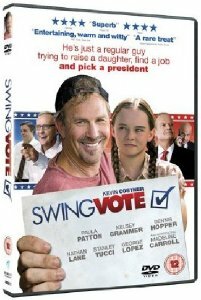 Set for DVD release on 28 September 2009, SWING VOTE will have you laughing all the way to the ballot station! In SWING VOTE, Kevin Costner stars as Bud Johnson, a man who can barely function socially, whose instincts are all wrong and whose impulses are either vulgar or diffident. Bud is out of control, totally irresponsible and cannot even keep his menial job at the egg-packaging factory. The one bright spot in his mundane existence is his precocious, over achieving twelve-year old daughter, Molly. She rescues her father from every situation, including the night he gets drunk and forgets to vote. Through a set of extraordinary circumstances when Molly tries to lodge Bud's vote on his behalf, and inadvertently makes it invalid, Bud becomes a celebrity. It is his vote that will decide who becomes the next President of the United States. A media-frenzy ensues and the world's eyes fall on one man from Texico in New Mexico. Each party will do or say anything to win the "swing vote" causing flip-flops on several policies such as anti-abortion, immigration, pro-environmental, and pro gay marriage stands. In the end Bud chooses to hold a final debate the day before he is set to recast his ballot, putting the nation's questions to both men. Does Bud vote for the right man?